This entry was posted on 7th December 2015 by Tom Richardson. I was thinking that it had been quite some time since I thought I had made a first ascent of a Himalayan peak. In fact it was way back in 1979 and I say 'thought' I had made a first ascent because unless someone builds a cairn, sticks a flag on it or writes about it somewhere, you just never know whether you are really the first. I’m not sure that it matters all that much anyway; it’s not a competition. These days the Nepalese government are very keen to encourage climbers to visit new areas. They are opening up new peaks of moderate height and difficulty. Trying to tempt people away from the honey pots of the Khumbu area into the 99% of the rest of the country. It’s good policy. KE Adventure Travel, one of my several employers, has always had in their heart the spirit of mountain exploration. For autumn 2015 they made a plan to make the first official ascent of Mukot Peak. A 6000m mountain located in a remote and wild corner of western Nepal, nestled at the flank of the rarely seen but phenomenal Dhaulagiri 2 (7751m). The plan was to form 3 groups, A, B and C, to attempt the peak. Using Sherpa support we would fix ropes on the steepest section that lead to the summit ridge. I was to lead Group B. I was excited at the prospect but as Group B somehow doubted we would make the actual first ascent. 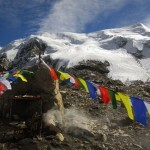 Group A, lead by Ade and Sirdar (chief Sherpa), Phanden had already done the reconnaissance of the trek. They left a week ahead of us and we followed in their footsteps. The approach to Mukot Peak is quite complex. The first stage is a flight from Kathmandu to the town of Nepalgunj. Set in the lowland Terai area the town is a hot and sweaty place. The next day is another flight, nearly as impressive as the famous flight to Lukla that takes you to the landing strip at Juphal. Set amid steep wooded hills with just a dusting of snow on them, creates a sharp contrast. Unusually though, the trek begins by descending to the valley bottom at a mere 2510m. After 4 hours of hot trekking we made camp at Dunai, the last village where there is a shop. After five days of wonderful trekking along the river valley, encountering wide sandy plains, narrow trails above huge drops, spectacular bridges and mountain vistas, we reached the final settlement of Mukot Village. The villagers here have a very tough life eking a living from their animals and a few fields in the high cold atmosphere. Here we also learned that 4 out of 12 members of Group A had climbed the mountain with Sherpa support. However none of the summiteers were either English or American, so first English and American ascents were still available. The next day our camp was on a flat strip of land strangely called Nani Goth, the view dominated by one of the most truly dramatic and rarely seen peaks in the world, Dhaulagiri 2. The Dhaulagiri Range contains one 8000m, and as the highest it is called Dhaulagiri 1, but its other 5 family members are equally breathtaking. Base Camp at 5000m was another dramatic spot right at the foot of the north face of Mukot Peak. It’s traditional to have a Buddhist ceremony of blessing called a puja before setting off up a mountain. Fortunately one of our Sherpas, Dawa, was an ex monk who obliged with the formalities. Base Camp was a cold place, especially at 3am the following day when the whole team - Pasang, the Sirdar, climbing Sherpas Dawa and Dorji and 7 members, including Janet, my wife, and myself all headed off to the mountain. We had planned to climb as two roped parties. At the point where we needed to put on crampons, one member turned back and returned to Base Camp with Dawa. The rest of us continued. Due to good snow conditions, we made good progress on the easier angled slopes. At two thirds height the terrain steepened considerably as did the exposure. Fortunately we were able to use the fixed ropes set up for Mukot A. The wind picked up as we closed in on a col from which we would ascend the ridge to the summit. On the ridge the wind accelerated, sapping energy and breath from the already tired team. We moved slowly along it and reached a small col. The summit was only just above us, but the cold and wind were fierce. Some of the party decided that they couldn’t go on. It was out of the question for anyone to hang around in the conditions so we began our descent. It had taken 6 hours from putting our crampons on. Descent was initially, a bit quicker as we were able to use the fixed ropes and descend using prusiks and slings as a safety back up. When the angle eased, things became more tiring as the adrenaline abated and real exhaustion set in. We finally reached Base Camp after nine and a half hours of climbing. With exhaustion the team were glad for the stop. Some members had given it everything and just collapsed in the doorway of their tents still wearing their boot. Only stirring to have spasms of coughing brought on by the effort and breathing the thin cold air. The next day we descended from the Base Camp. Our aim was to continue the trek, crossing several high passes, including the first one at over 5700m. It would be a tough challenge to any trekking party but we were severely weakened by our climb. Kala Pattar, the well-known high point above Everest Base Camp for example, is a trekkers high point and it’s only 5545m. Many of the team were struck down with coughs, sickness, bad stomachs and exhaustion too. The camp below the pass was at 5000m, cold and windy. I was concerned that we would have difficulty getting over the first, let alone the subsequent ones. The weather had been kind so far. It hadn’t snowed, but if it did it could strand us, or at least make us late for our rendezvous at Kagbeni. From there the plan was to trek to Jomsom, fly to the regional capital Pokhara and thence to Kathmandu. In the morning my decision became easier, but not in a good way. One of the mule men who had been with us all the way from Juphal was in a state of distress. One of his precious mules had died from the cold in the night. It would have been unfair to even ask him to go on. We attempted to at least financially recompense him for his loss, sorted out tips for all the staff, and I called up a helicopter to take the sick and their partners to hospital. The remaining two members flew out too. Their disappointment and relief was compensated by the ride of a lifetime in the helicopter. We passed our route on Mukot Peak and following the Dhaulagiri Range down to the airstrip at Jomsom. The officials in the Ministry of Tourism weren’t bothered that we had only reached just below the summit and, back in Kathmandu handed out certificates accordingly. We may have been the second ascent and first English and first American ascents. It doesn’t matter much; what is for certain is that we had a hell of an adventure. If you are wondering what happened to Group C, well they followed behind us and as soon as they reached the Base Camp, an enormous storm blew in. Overnight they had more than a metre of snow. It was all they could do to evacuate Base Camp with all the equipment and retreat back along the trek towards Juphal from where they flew back to Nepalgunj and Kathmandu. If the outcome was certain, it wouldn’t be an adventure and would be hardly worth doing.